As a parent, I think I relate to this pumpkin maybe a little too much. I know I get that exact expression on my face every time I step on my kids' legos. This pumpkin not only looks great, but it has some real meaning, capturing an essential human experience. The only way this could be any better is if the legos were carved out of pumpkins too. 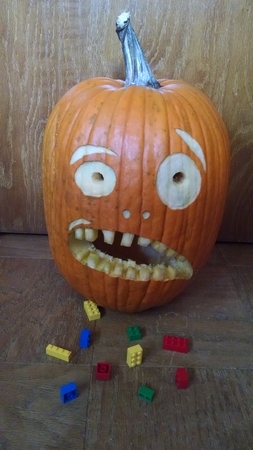 Come to think of it, maybe I should carve a bunch of pumpkin legos and switch them out with my kids' real ones. I don't think they'll know the difference, until they start looking for bricks in any color other than orange.